Geology and Soils: The RNA is within the transition zone between soils of calcareous origin (Grand Prairie, 10%) and soils of arenaceous origin (Western Cross Timbers, 90%). Limestone mesas in the area contain some surface material suitable for road surfacing, but none has been removed. The topography is gently rolling with steeper slopes up to 20% in grade. Plant Communities: The RNA contains soils and vegetation of two major vegetation zones in Texas, the Western Cross Timbers and the Grand Prairie. Little of the Western Cross Timbers vegetation remaining today is representative of the original composition, but the RNA contains vegetation similar to the original. The Western Cross Timbers section of the RNA is composed of oak savannah with post oak (Quercus stellata), blackjack oak (Q. marilandica), live oak (Q. virginiana) and juniper (Juniperus sp.). The Grand Prairie vegetation is open grassland with scattered clumps of live oaks. Common Shrub Species: Common shrubs include wild plum (Prunus angustifolia), sumac (Rhus spp. ), greenbrier (Smilax spp.) and others. Common Herbaceous Species: There are mixed mid and tall grasses in the understory and openings. Little bluestem (Andropogon scoparius) is the most common grass and there is a sparse component of forbs and shrubs. A number of native wildlife species characteristic of prairie and oak-savannah inhabit the RNA. The only large species present today is the white-tailed deer (Odocoileus virginianus), but in the past, bison (Bison bison bison), black bear (Ursus americanus), gray wolf (Canis lupus), antelope (Antilocapra americana) and other species occurred in the area. A list is included in the Establishment Record. Common Bird Species: Quite a few seasonal, permanent and migrating birds inhabit the RNA. A list is included in the Establishment Record. Ezell, A.H. 1980. An ecological evaluation of the Western Cross Timbers Research Natural Area. USDA Forest Service, Southern Forest Experiment Station. 98 pp. Quinn, W.J. 1996. 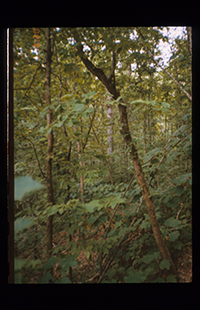 A study of the vegetation of the Western Cross Timbers Research Natural Area. Unpublished Report.